WPeMatico is for autoblogging. 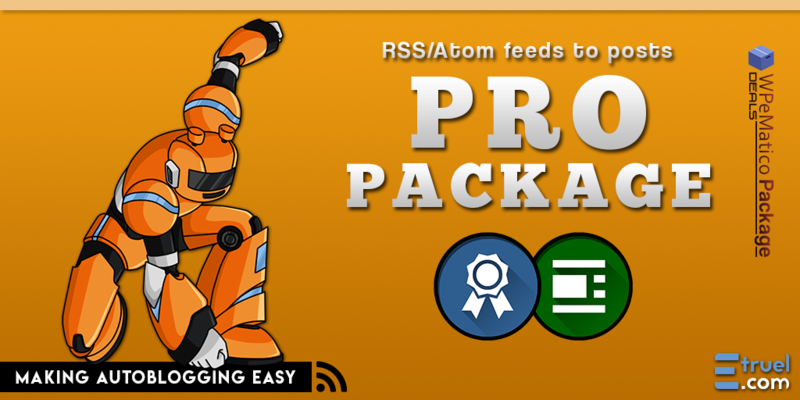 Automatically create posts from the RSS/Atom feeds you choose, which are organized into campaigns. Lot of new features with contents, images, tags, filters, custom fields and much more extends in WPeMatico free plugin, going further than RSS feed limits and takes you to a new experience. Feeds and options are organized into campaigns. Use WordPress custom post types for campaigns. Comfortable interface like Worpress posts editing for every campaign. You can move and close metaboxes. You can paginate and filter campaigns list by name. Feed list with scroll into campaign. Feed search filter. Inline smaller help on every metabox. Colored boxes for knowing what I’m doing. It’s possible to add as many feeds as you want, and add them to multiple already created categories or create new ones. Categories found on source item can be added to the post; If category does not exist, then will be created. Integrated with Simplepie library in WordPress. External cron or WordPress cron jobs. Max items, comments, author and lot of options. Assigns options in campaign like max items to fetch every time, comments open/closed, current or original date, author, trackbacks, etc. Custom post type, status, post formats and lot of options. You can assign every item as post, page or another custom post type you have on your wordpress. Draft, pending or published Status and also assign a Post Format that your theme supports. Image processing integrated with WordPress. Images caching are integrated with WordPress Media Library and attach to posts for featured images. Upload remote images to default Uploads folder set on WordPress settings or link to source to save resources. Fully configurable in campaign. First image attached to a post enable as Featured Image. You can strip all links from content and leaves them as text. You can strip all HTML tags from content and saves it as pure text. Campaign post template allow to modify the content fetched by adding extra information, such as text, images, campaign data, etc. before save it as post content. You can use some tags that will be replaced for current value. Words Rewriting. Regular expressions supported. The rewrite feature allow you to replace words or phrases of the content with the text you specify. Words Relinking. Define custom links for words in content. The Relinking feature allow you to make simple links from some words with origin and re-link fields. Define custom words to search into content or title to assign the post to specified category. You can set to see the log on popup in campaign list or send to custom e-mail, with SMTP or WordPress php mail function on every executed cron or only on errors with campaign items. Wordpress permalinks to Source site. Option to replace title links (Permalink) to external source. (This feature depends on others filters that can call permalink for themes or plugins installed on your site). A widget on WordPress dashboard with processed and next campaigns to run. You can choose what role can see the dashboard widget. English and spanish languages included. Also .po and .mo files to translate are included. You can see detail of other custom transations that are included on free version readme file. Attempt to get Full Content of source site. Fix and correct wrong HTML on content. You can enable this on txt config file when you get the content through Full content feature. Support Custom taxonomies for Custom Post Types. Just activate the Professional plugin and your campaign will show the metaboxes to select the custom taxonomies for the Custom Post Type selected. Delete last HTML tag option. Many sites add own custom data on the last html tag. May be <p> or <div> or <span>, anyway, you can take off here. Delete last portion of the content after a phrase. With this option you could delete all the content after a word or phrase until the end. Supports Multifeeds, paged RSS feeds. WordPress make paged feeds for its websites like /feed?paged=2. Since 1.5 version, the addon Professional allows fetch as many pages as you want from every feed URL. Import the URL feed list into a campaign. If you have a list of feed that you want to add into a campaign, you can import all of them with a few simple clicks pasting the list as txt format. Automatic assign 'per feed' author name. Automatic assigns author names based on source feed or custom typed author. Automatic assign the author from <author> tags. Get the author names based on every <author> tag from the source feed items in the RSS. If the user does not exists then creates it as a WP user. Strip the HTML and count how many words or letters are in content and allows assign a category, cut the content or skip the post. Keywords filtering. Include filters by source Categories. Regular expressions supported. You can determine if skip or publish the post for certain words in title, content or in the source item categories. PRO Version allow change the title of original post and also you can add a counter in the title name to don’t get duplicated titles. Extra filters to check Duplicates with Custom titles. PRO Version allow enable an extra query when fetching to check the titles before insert the new post in database to skip inserting the post if gets duplicated titles. Custom fields with dynamic values. Feature Custom fields with dynamic values allow you to add as many fields as you want with the possibility of add values as word templates replaced on the fly when the campaign is running. This allow add custom fields values like permalink, images urls, etc. Import and export multiple campaigns. This feature allow you to export and download a file from a single or a list of campaigns, then later you can upload and import the campaigns in another or same wordpress with WPeMatico professional version installed. You can set the URL of a default Featured image if not found image on content. Filter images by width or height. You can set the min o max width or height to set the Featured image. Also Filter and delete images in posts content just by width or height of every image. Rename all the images uploaded to the website with a mask field where you can type or use the post name. Get audio and video from the enclosures. This feature allows you to get the audio and video files from the feed enclosures and podcasts. Adds support for extra video and audio file types. This feature allows you to import media files for audio and video with the extensions mp3, ogg, wav, wma, m4a and mp4, m4v, mov, wmv, avi, mpg, ogv, 3gp, 3g2. Adds support for partial downloads of big video and audio files. This feature allows you to import big media files for audio and video uploading them by ranges of kbytes instead upload the entire size at once. Tweak the audio and video files. Strip the queries variables in the URLs of audio and video links. Audio and video filenames renamer. Strip audios and videos html tags from the content. All features are working on almost all servers. Try WPeMatico FREE Version to be sure before buy.